Wool-Aid has received its second quarterly contribution from the Amazon Smile Foundation, and thanks to all of you wonderful supporters, it has really grown! It takes $1000 in eligible purchases at .5% in order for the minimum payment to be processed. In the period from October through December 2015, we collectively supported Wool-Aid through $17,210 in Amazon purchases, which turned into a donation to Wool-Aid from the Amazon Smile Foundation of just over $85! Please spread the word and encourage more of your friends and family to support Wool-Aid through Amazon Smile—and help kids around the world smile, too! If you make purchases at Amazon, please link your account to Wool-Aid, Inc. and shop through the smile.amazon.com portal. 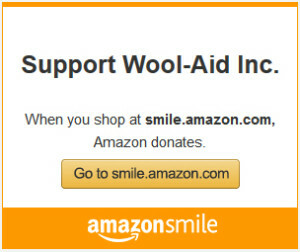 The direct link to shop and support Wool-Aid is http://smile.amazon.com/ch/46-5580013. Wool-Aid and the Wool-Aid Kids thank you!